1. 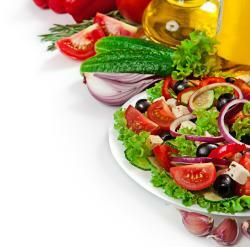 A meta-analysis involving over 30 studies and 1,784,404 people in all, has shown that a higher adherence to a colourful Mediterranean diet was associated with a significantly lowered risk of developing any cancer, but particularly colorectal, breast cancer, prostate cancer, liver cancer, pancreatic cancer, head and neck and even lung cancer. Those who adhered most to the rainbow diet had lowered cancer mortality. The study was published online (Oct 16th 2015) by researchers Lukas Schwingshakl and Georg Hoffmann. 2. In a second meta-study, this time involving Cancer Stem Cells, scientists analysed 30 years of research studies to produce a report on the bioactive food compounds that can best help you kill off a cancer. Chris Woollams, former Oxford University Biochemist and author of The Rainbow Diet said, "The results of both meta-studies were no surprise to readers of the book. We’ve been telling people exactly this since 2006". The ’inconvenient truth’ of chemotherapy (and even the ‘clever’ new world of biologic drugs), is that no drug exists today in September 2015 that can kill Cancer Stem Cells (CSCs), which lie at the heart of all cancers. Orthodox medicine can knock the tumour back 50, 60 or 70 per cent; but it cannot finish the job off. The Truth – you do the rest yourself. In 2012 we told you about a report from Dr. Young S. Kim of the NCI in America who said that eating bad foods caused a cancer to re-grow, whilst, eating good foods containing bioactive natural compounds could prevent that regrowth. She even named the bioactive compounds and told people they could find them in quality supplements. In this second meta-study, research looked at phytochemical and herbal compounds where scientific evidence has shown them capable of killing CSCs in vitro and in vivo. The researchers go on to talk of the ‘Ideal chemotherapy agent – a drug to target the bulk of the cancer plus a bioactive natural compound (or more) to kill off the CSCs’. 5. Piperine – a bioactive compound in black pepper; works synergistically with curcumin. 12. Luteolin – found in greens, and red and yellow peppers. All of these are covered in The Rainbow Diet, our book on the subject. And all have epigenetic benefits being able to correct message loss in cancer cells. Two important non-foods for this would be vitamin D (produced by the action of sunshine on cholesterol stores below the skin) and melatonin (produced by the pineal gland when you sleep). But we’ve told you all this before - many times - at CANCERactive. Go to: Buy the book - ’The Rainbow Diet and how it can help you beat cancer’ at the lowest prices in the USA, Australia and UK.